The Semeuse Type French stamps were first introduced during 1903. Semeuse, in French, means "Sower". 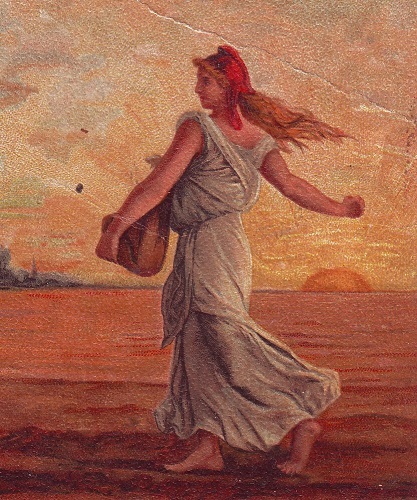 The new design features a French farm girl walking across a plowed field at sunrise. She is carrying a bag of seed in one hand, and spreading the seeds with the other hand. La Semeuse has been one of the most prominent allegorical symbols of France for more than a century. Every stamp collector is probably familiar with these stamps. Just about every France stamp collecting packet contains many used condition examples of these. Of course, the mint condition stamps are much more difficult to locate. The French stamps with the Semeuse designs were issued over a period of 35 years. The European stamp catalogs list these stamps in the particular years that they were issued. This can be very confusing, as both major types of the Semeuse issues are intermingled with charity stamps, commemorative stamps, and airmail stamps, as well as the Sage, Blanc, Mouchon, and Merson definitive stamp types, which were also being issued concurrently, during this time period. The Scott catalog, lists the major types of the Semeuse stamps in long sets, ordered by denomination. In order to keep this review as simple as possible, I will retain the Scott catalog presentation format. The Yvert & Tellier numbers will also be used, however the stamps themselves will be illustrated and grouped the way they are presented in the Scott catalog. The seventeen new Semeuse type definitive French stamps shown above, with the lined background, were issued between 1903 and 1938. This type utilizes most of the elements shown in the image at the top of this page, including the field and the rising sun in the background. The catalog attributes, for stamps with the lined background with the Sun, are as follows. 10 C. (1903 - Y&T #129, Sc. #138) - Rose. 15 C. (1903 - Y&T #130, Sc. #139) - Slate Green. 20 C. (1903 - Y&T #131, Sc. #140) - Violet Brown. 25 C. (1903 - Y&T #132, Sc. #141) - Dull Blue. 30 C. (1903 - Y&T #133, Sc. #142) - Violet. 50 C. (1921 - Y&T #161, Sc. #144) - Dull Blue. 45 C. (1926 - Y&T #197, Sc. #143) - Light Violet. 50 C. (1926 - Y&T #198, Sc. #145) - Gray Green. 50 C. (1926 - Y&T #199, Sc. #146) - Vermilion. 60 C. (1924 - Y&T #200, Sc. #148) - Light Violet. 65 C. (1927 - Y&T #201, Sc. #149) - Rose. 75 C. (1926 - Y&T #202, Sc. #151) - Rose Lilac. 80 C. (1925 - Y&T #203, Sc. #152) - Vermilion. 85 C. (1924 - Y&T #204, Sc. #153) - Vermilion. 01 F. (1926 - Y&T #205, Sc. #154) - Dull Blue. 65 C. (1927 - Y&T #234, Sc. #150) - Gray Green. 50 C. (1938 - Y&T #362, Sc. #151) - Greenish Blue. Due to the heavy demand for 10 Centime French stamps caused by a postal rate change, a 10 C. denomination stamp, utilizing the modified design shown above, was quickly issued on April 13, 1906. These new French stamps feature the Sower, walking on raised ground, with a solid colored background. 10 C. (1906 - Y&T #134, Sc. #155) - Red. This new stamp design had a much nicer appearance than the previous one with the Sun and horizontal lines in the background. However, when the new Sower stamps with solid color backgrounds went into regular production later in 1906, the raised ground under the Sower's feet was removed from the design. The new Semeuse Type French stamps (without raised ground) with solid colored backgrounds went into production in 1906 and continued through 1937. They are all shown above. I have also seen these referred to as the Semeuse Cameo Type. The 10 Cent. Red, 10 Cent. Green, and 35 Cent. Violet denominations come in two major Scott-listed types. Type I has thin numerals and letters. Type II has thicker numerals and letters. The Type I stamps are the more expensive of the two types. These types are all shown in the images above. There are actually many different types of these Sower stamps with solid color backgrounds listed in the Yvert & Tellier catalog, so listing the stamps shown above by Yvert & Tellier catalog numbers, with cross-references to the Scott catalog numbers just isn't going to work. In this case, the French stamps in the table below will be listed by the Scott catalog numbers, with cross-references to the Yvert & Tellier catalog numbers, where possible. Any serious effort at specializing in these issues will absolutely require the use of the Yvert & Tellier specialized catalog. 01 C. (1933 - Sc. #156, Y&T #277A) - Olive Bister. 02 C. (1933 - Sc. #157, Y&T #278) - Dark Green. 03 C. (1933 - Sc. #158, Y&T #278A) - Vermilion. 05 C. (1907 - Sc. #159, Y&T #137) - Green. 05 C. (1921 - Sc. #160, Y&T #158) - Orange. 05 C. (1934 - Sc. #161, Y&T #278B) - Cerise. 10 C. (1906 - Thin Lettering - Sc. #162b, Y&T #135) - Red. 10 C. (1907 - Thick Lettering - Sc. #162, Y&T #138) - Red. 10 C. (1927 - Thin Lettering - Sc. #163a, Y&T #188) - Green. 10 C. (1921 - Thick Lettering - Sc. #163, Y&T #159) - Green. 10 C. (1932 - Sc. #164, Y&T #279) - Ultramarine. 15 C. (1926 - Sc. #165, Y&T #189) - Red Brown. 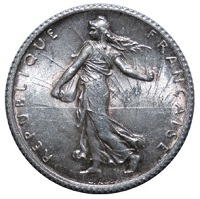 20 C. (1907 - Sc. #166, Y&T #139) - Brown. 20 C. (1926 - Sc. #167, Y&T #190) - Red Violet. 25 C. (1907 - Sc. #168, Y&T #140) - Blue. 25 C. (1927 - Sc. #169, Y&T #235) - Yellow Brown. 30 C. (1907 - Sc. #170, Y&T #141) - Orange. 30 C. (1921 - Sc. #171, Y&T #160) - Red. 30 C. (1925 - Sc. #172, Y&T #191) - Cerise. 30 C. (1925 - Sc. #173, Y&T #192) - Blue. 30 C. (1937 - Sc. #174, Y&T #360) - Copper Red. 35 C. (1926 - Thick Lettering - Sc. #175, Y&T #136) - Violet. 35 C. (1906 - Thin Lettering - Sc. #175b. Y&T #136a) - Violet. 35 C. (1937 - Sc. #176, Y&T #361) - Green. 40 C. (1925 - Sc. #177, Y&T #193) - Olive. 40 C. (1926 - Sc. #178, Y&T #194) - Vermilion. 40 C. (1927 - Sc. #179, Y&T #236) - Violet. 40 C. (1928 - Sc. #180, Y&T #237) - Light Ultramarine. 01.05 F. (1925 - Sc. #181, Y&T #195) - Vermilion. 01.10 F. (1927 - Sc. #182, Y&T #238) - Cerise. 01.40 F. (1926 - Sc. #183, Y&T #196) - Cerise. 02 F. (1931 - Sc. #184, Y&T #239) - Prussian Green. ALL of the Type Semeuse (Sower) postage stamp issues exist in many different formats and varieties. For details on specialization, please refer to the Yvert-Tellier catalog. Here is a link to the France catalog on Yvert-Tellier's website.